This book provided the record of each soldier, their description, their pay, leaves of absence and assignments. If you look on line 1 you will see Nov. 1861: Nov. 19, Ft. Holt Enlisted. Line 2 Jan, 1862: Absent sick at Gen. Hosp. Mound City, Ill. Mound City is located in the southern tip of Illinois on the Ohio River, just north of Cairo, Illinois where the Ohio meets the Mississippi and just a few miles from Paducah, Kentucky. 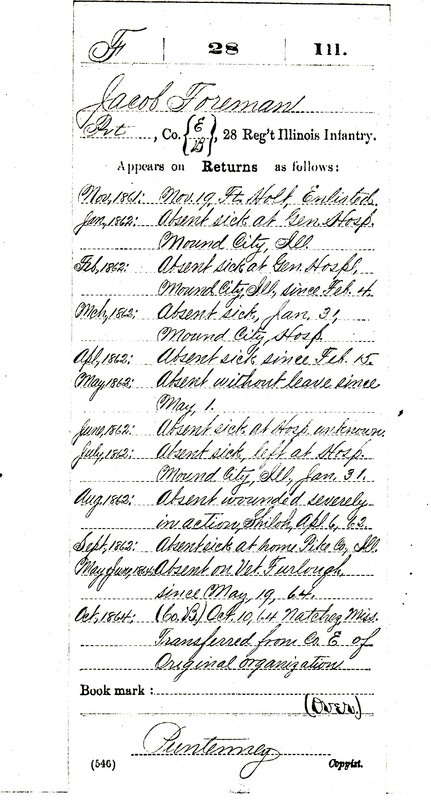 Line 3 Feb 1862: Absent sick at Gen. Hospl.at Mound City, Ill, since Feb 4. Line 4 March 1862: Absent sick, Jan 31, Mound City Hosp. Line 5 Apl, 1862: Absent sick since Feb 15. Line 6 May 1862: Absent without leave since May, 1. Line 7 June, 1862: Absent sick at Hosp. unknown. Line 8 July, 1862: Absent sick, left at Hosp, Mound City, Ill, Jan. 31. Line 9 August 1862: Absent wounded severely in action, Shiloh, Aprl 6, 62. Line 10 Sept, 1862: Absent sick at home, Pike Co. Ill.
My blog posts have provided information on the movement and activities of Company E of the 28th Illinois Volunteer Infantry. This record provides an incredible insight in where Jacob was during this time period, although it appears the company clerk lost track of him for several months between March and May of 1862. Jacob must have recovered enough from typhoid fever to join Company E of the 28th Illinois Infantry at Pittsburgh Landing for the battle of Shiloh April 5, 6 and 7, 1862. In September he is home recovering from his illness and wounds in Time, Pike County, Illinois. In March, Maj. Gen. Henry W. Halleck, commanding U.S. forces in the West, advanced armies under Maj. Gens. Ulysses S. Grant and Don Carlos Buell southward to sever the Southern railroads. Grant ascended the Tennessee River by steamboat, disembarking his Army of the Tennessee at Pittsburg Landing, 22 miles northeast of Corinth. There he established a base of operations on a plateau west of the river, with his forward camps posted two miles inland around a log church called Shiloh Meeting House. Halleck had specifically instructed Grant not to engage the Confederates until he had been reinforced by Buell’s Army of the Ohio, then marching overland from Nashville. Once combined, the two armies would advance on Corinth and permanently break western Confederate railroad communications. No soldier who took part in the two day’s engagement at Shiloh ever spoiled for a fight again,” recalled one Union veteran. “We wanted a square, stand-up fight [and] got all we wanted of it.” Besides preserving the site of the bloody April 1862 battle in Tennessee, the park commemorates the subsequent siege, battle, and occupation of the key railroad junction at nearby Corinth, Mississippi. April 4, 1862 – “Nothing of importance occurred until Friday night April 4, when the enemy sent out a Brigade as a feeler of our position.” General Hurlbut’s Division was put in line, and moved out on the enemy. The night was very dark, and the roads very muddy. After some heavy fighting, for a short time, the rebels fell back. The 28th moved out with the Division a mile and half, and then returned to camp. April 6, 1862 – Early Sunday morning, April 6, the 28th was called out by the long roll into line, and marched one mile to the front. It was assigned to a position on the left of the line, in the Peach Orchard. The enemy immediately attacked it, but was repulsed with heavy loss, and the 28th held position, under great odds, from 8 o’clock a.m. until 3 o’clock p.m. At 9 o’clock a.m., General U.S. Grant and staff rode up, and the 28th was ordered to hold its position at all hazards, which it did until ordered back by General S.A. Hurlbut, commanding the old fighting Fourth Division. In the conflict the 28th lost heavily in killed and wounded. Lt. Col Kirkpatrick was among the killed, and his horse with him; Major B. C. Gilliam was badly wounded in the left shoulder and his horse killed under him; Adjutant J.B. Meade was mortally wounded and his horse killed. 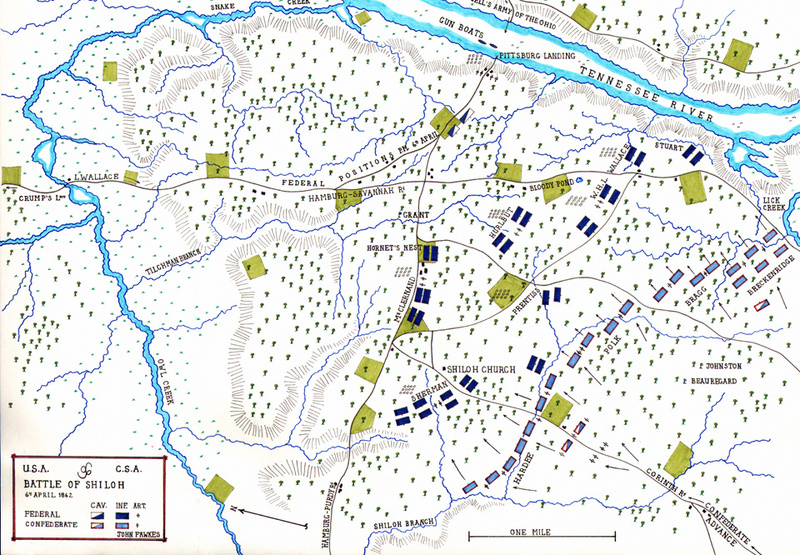 April 7, 1862 – On the morning of the 7th, the 28th held a position on the right of the line and was hotly engaged until the battle closed and the victory was won. During those two long, trying days, the Regiment behaved nobly, and was never broken or driven back by the enemy, though often heavily pressed. The 28th Regiment of Illinois Volunteers sustained 239 killed, wounded and missing. Captain Roberts of Company K, was taken prisoner. Jacob Foreman was 22 years and 4 months old.